Finally ... a can opener that handles the mess for you! Open the can, grad the lid with the magnet, push the button and it releases the lid into the trash. 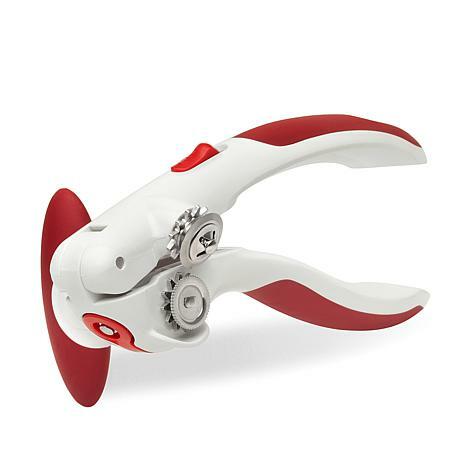 Clever and so easy to use, this can opener could easily become your new kitchen favorite. Very nice & easy to use with out a struggle. So far, I love this can opener. I do not like electric can openers. They take up space plus stop working after less than a year. This one requires no effort to puncture the cans & no effort to turn the knob. Has a unique lid lifter also. Price was decent. I am impressed. It was a good buy. 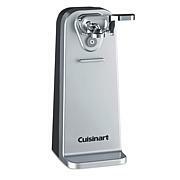 In the past I have owned three of those battery operated can openers that boast a quick whizz along the rim of cans. And all 3 of them had a very short life. They were junk. So I went back to the original $3.00 hand crank opener and stayed with it for about 3 years until recently when I went looking for a better opener that was easier for my senior hands to operate. And voila! I found the Zyliss Lock-N-Lift at HSN. 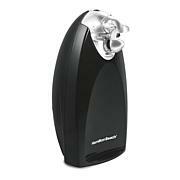 This product is a jewel. It's so easy to work and a breeze to keep clean.